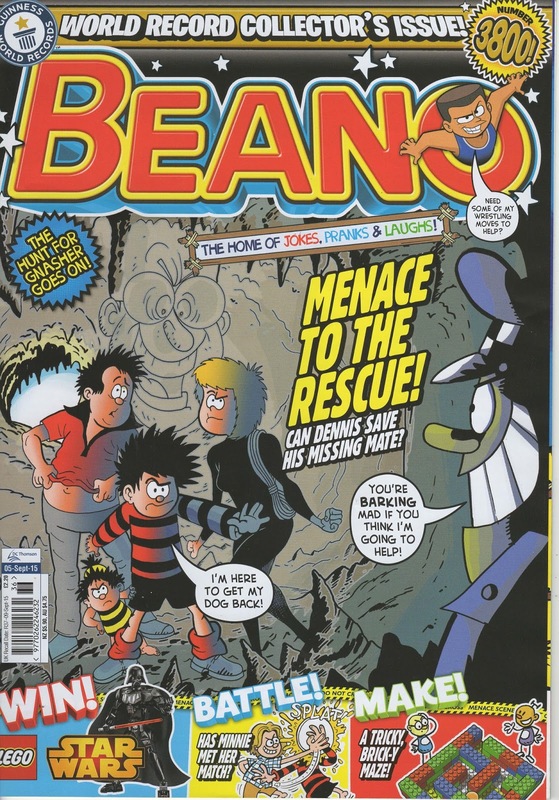 Comics UK :: View topic - the Beano no.3800! World Record Collectors issue! Post subject: the Beano no.3800! World Record Collectors issue! It has a new logo and a blue inner colour..
Has Commando made it into the record books has well? loving the longer stories of Dennis hop other character like Adventure Tim will get longer stories..
Post subject: Re: the Beano no.3800! World Record Collectors issue! Fame is so ephemeral, isn't it Peter? The euphoria will only last one week at which point issue 3801 will break that record, which will be broken again seven days later, and so on until the end of time, or until the last issue of The Beano, whichever comes first. No wonder they are using blue! To be fair is there another reason they are using Beano 3800 as the record breaker? The final print issue of The Dandy was issue 3610 and The Beano was already ahead in issue numbers by then due to The Dandy's fortnightly xtreme years. I see that nobody has yet answered Gilly's question. Given that it is a Guinness record, I'm still left wondering therefore in what category it has won it. The record is for longest running weekly comic. 1. 3800 is a landmark issue anyway. 2. It may have been partly double insurance due to the wartime fortnightly publication. Thank you for the reply, AndyB. However, your answer is incomplete because you don't say whether it is just a British record or a World record. I don't see either what the wartime fortnightly publication has to do with it since we are judging the length of the run by issue numbers rather than by time. I would also like to know please which comic's record of 3799 issues was broken by The Beano. As far as I'm aware, the Beano took the record from the Dandy (3610 issues, but the total was a bit lower when it was overtaken), which took it from Comic Cuts (3006 issues). 4th place is probably Illustrated Chips, which ran for 2997 issues but folded at the same time as Comic Cuts (12 September 1953) - had it ran a couple of months longer it would've taken the record. Technically The Beano could have claimed the record as soon as Dandy Xtreme launched, due to Dandy no longer being weekly - by the time it was weekly again The Beano had overtaken it and thus grabbed the record once and for all. They could have easily used 3700 as the milestone issue. There was no reason to wait until issue 3800. Thank you Digi and Bruce for those clarifications, which move us further forward. All that remains to be established, even if the numbering of Dandy Xtreme started at 1, is the actual issue number of The Beano for that week during the fortnightly run of Dandy Xtreme when it actually overtook The Dandy/Dandy Xtreme in terms of numbers issued. Issues 3700 and 3800 are clearly irrelevant. It happened in 2008, in the 3400s. Beano 3411: Dec 15, 2007, Dandy 3425: Dec 8, 2007 - Dandy still 14 ahead at this point. Beano 3462: Dec 26, 2008 - the Dandy's issue number would be roughly 3451 at this point based on the 2007 Christmas issue's number plus 26, making it 11 behind Beano's. Could someone with a complete run across this period please give me the information I'm asking for. I can tell you the Dandy Xtreme continued with the old Dandy numbering, and didn't have a number one, per se. Thank you for that excellent clarification, Bruce. It should, hopefully, now be a simple matter for anyone who has the full runs of Dandy Xtreme and The Beano for that period to come up with the record-breaking issue number of The Beano. Kashgar? While happy that Beano has broken a record, and I might actually buy a copy to see what the fuss is about, I had a look at some other long running titles and can't find anything close. Closest seems to be Frew's Phantom, which is now over 1700, so nowhere near. DC Comics stalwarts, such as Action and Detective don't even come close. Any other ideas, please?